The Salmon Valley Chamber of Commerce is a business organization whose goal is to generate support for and promote the well-being of it's member businesses in the Greater Salmon Valley. The Chamber was established in 1977 as the Salmon Chamber of Commerce, Inc. Founding board members include Bill Allen, John McKinney, Ken Beller, and Gary Anderson (just to name a few). 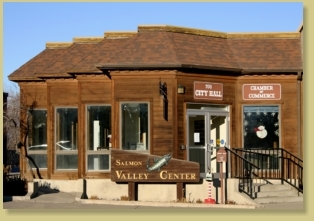 We changed our name to the Salmon Valley Chamber of Commerce in 1982 to serve a broader area. Since then, our organization has served our 100+ members and served as a visitor's bureau for the region. We have organized many community events over the years. These days, we sponsor the local 4th of July Salmon River Days and the Salmon Marathon.